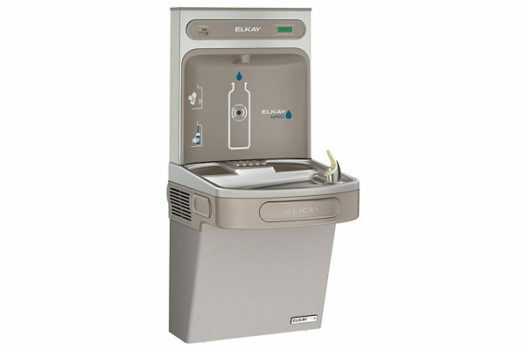 The new water fountain is a 2 in 1, where you can drink and refill your water bottle. For students at Parkdale looking to drink some refreshing water, some may have found that finding a working water fountain the hallways is a challenge. Many students argue that the majority of the water fountains in Parkdale are in bad condition, and some even have a noticeable and distinct tint in the water that sometimes give second thoughts to the potential user. At the start of the school year, however, a new water fountain emerged in the cafeteria. The fountain has new technology and a new shiny look, but most importantly the water tastes fresh. With the EZH2O fountain, students, faculty and visitors are not only able to get fresh water quickly and safely but also help save the planet while they’re at it. The old fountains don’t seemed to have made the best reputation for themselves. According to becausewater, “[one] in 38 children in the U.S. is predicted to have lead poisoning.” Several students noted that they participated in a lead test in water from the Parkdale fountains last year and found minor traces. Studies show that lead poisoning “disproportionately affects children in low-income families living in older housing,” which adds to socioeconomic despair. Because Parkdale is a little over 50 years old, the fountains may have been experiencing the wear and tear that comes with age. It is expected that the new fountains will eliminate this potential danger. Parkdale will be replacing all fountains with the EZH2O within the next year.